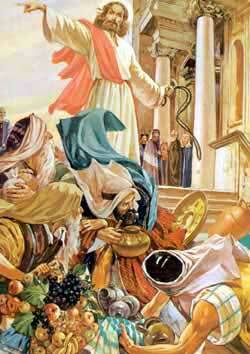 Jesus upsets the tables of the money-changers and drives them from the temple. HE TIME HAD come again for the yearly Passover Feast in Jerusalem, and from every part of the land groups of people came flocking to attend this great religious meeting. In one of these groups were Jesus and his friends, Andrew, Simon, Philip, and Nathaniel. These men were also called his disciples, or learners; for they often went with him from one place to another to learn more about his wonderful teachings. You remember that only the priests were allowed to enter the rooms of the temple, and that the people who went there to worship stood in the courts outside the rooms and prayed while the priests offered sacrifices upon the altars. When Jesus came with his disciples and friends to attend the Feast of the Passover, he found much disorder in the court where the people were supposed to worship God. This beautiful court looked more like a market-place than like a house of prayer, for men had brought oxen and sheep and doves in there to sell as sacrifices to those who came from distant country places to worship God. And other men, who were called money-changers, were sitting by small tables exchanging pieces of silver money, called half-shekels, for the coins people brought from distant lands. Every Jew, we are told, who was twenty years old or older, gave one of these half-shekels to the priests each year to buy sacrifices and to supply other needs in the temple worship. No other coins except half-shekels could be received by the priests, so the Jews who came from other lands had to exchange their coins for half-shekels before they could pay their dues to the priests. Jesus was grieved to see the disorder in the temple court. He knew that worshipers could not enjoy praying in such a noisy place, where buying and selling and money-exchanging were going on around them. So he made a whip by tying small cords together, and then he drove out the oxen and sheep and the men who kept them. He even upset the tables of the money-changers, and he told them that his Father's house was a place of prayer and should not be used for a market-place. No doubt other people had been grieved to see the disorder in the temple court at the time of the Passover feast. But none of them had ever dared to do as Jesus did at this time. None of them had courage enough to try to correct this great evil. But not all of the Jews were pleased to see Jesus drive the money-lovers and the owners of the oxen and sheep and doves into the streets outside the temple. Some of them came to Jesus and asked him for a sign to prove that he was some great man, with authority to do such things. But Jesus knew they would not accept him even when they should see a sign, so he answered, "Destroy this temple, and in three days I will raise it." He spoke about himself, meaning his body, which he knew the Jews would cause to be crucified, and which he would raise up from the dead after three days. But the Jews did not understand, and they thought he meant the temple on Mount Moriah, which Herod, the king, had rebuilt for them. They said, "Many years were spent in building this temple, and you say you could rebuild it in three days!" Then they shook their heads doubtfully and walked away, for they did not believe his words. At this Feast, Jesus began to teach the people and to do miracles among them. And many believed in him when they heard his words and saw the great works which no other man could do. One of those who believed in Jesus was a ruler among the Jews, a Pharisee. His name was Nicodemus, and he was a very rich man. There were many Pharisees among the Jewish rulers, and these men were proud and unwilling to accept either John the Baptist or Jesus as being teachers sent from God. They themselves wished to be the religious leaders of the Jews and they despised humble men like John and Jesus. But Nicodemus was not like his proud friends. He heard Jesus teach the people who had come to worship at the Feast, and he believed that surely Jesus was some great man. While the other Pharisees were finding fault with Jesus, Nicodemus longed to hear more of his teachings. So one night he came to the place where Jesus stayed while he was in Jerusalem, and asked to have a talk with this man from Galilee. Jesus received Nicodemus gladly, and talked to him about the kingdom of God. He told this ruler that no man could enter God's kingdom unless he should be born again. Nicodemus wondered how this could be possible, so Jesus explained to him the secret of the new birth, which we call a change of heart. Never before had this wise ruler of the Jews heard such strange words, and he listened wonderingly while Jesus told about the great love of God. "This love," said Jesus, "caused God to give his only Son that whoever believes in him may not die because of sin, but have life forevermore." Then Jesus reminded Nicodemus of the story of Moses in the wilderness when the people had sinned and God had sent fiery snakes into their camp. Nicodemus remembered the story, and Jesus said, "Just as those people who were about to die from the snake-bites found relief from their pain by looking at the brass snake that Moses put up on a pole in their camp, so the people who have sin in their hearts may find relief from sin by looking at the Son of man, who shall be raised up among them." Nicodemus did not understand that Jesus was speaking about the cruel way in which he should some time be put to death to save the people from their sins. But Nicodemus did believe more strongly than ever that Jesus was a great teacher who had come down from heaven to dwell among men. Faith in Jesus as the Redeemer of the world gives everlasting life.